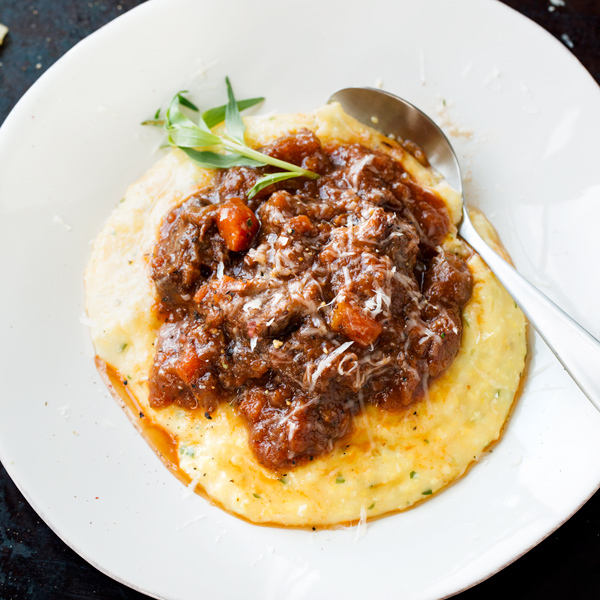 An earthy and comforting meal like polenta with braised oxtails in a rich ragu is something that offers some solace on those occasions when the sun hides behind the clouds, its friendly light obscured from view; but hope can be found in simply remembering that the sun is still present, that it is always there, even if momentarily hidden. I find that so many times it is in the doing of mundane activities, like taking an early morning walk, that clarity and truth are revealed. Though the rain showers were not quite through with us just yet, still lingering lazily from the night before, offering sprinkles in fits and starts, I decided to take my walk around our neighborhood hillside anyway to drink in the lush green scenery with its raindrop-laced blades of thick, un-cut grass, and breathe in the fresh air that still smelled faintly of night-time foliage. The sky was that deep purple-blue mingled with grey, that slightly foreboding color of dark weather and the cold, with a thick layer of hazy clouds that hung in clumps in certain areas; yet in the distance, I could see where the clouds began to thin out, making way for a more luminescent cover, the kind that is sheer and pale, where baby blue finally has some chance of peaking out. About half way around the hill, the light little drops began to fall once again, and I had the sound of crispy cereal popping in milk all around me—that familiar sound, gently prompting me to pick up my pace a little in the event that things were about to get wetter. But thankfully, that only lasted a little while, and the rain, once again, eased off. As I continued on, making my way to the top of our hill, I caught a glimpse of the sun gently nuzzling its face against the clouds, parting them ever so slightly, just barely enough to quietly yet confidently reveal that it is indeed still there, just behind those clouds, and has been all along. That the light is always present, just beyond those darker, more troubling times, even if one can neither see nor feel it. That hope, love, God, is always there and available, just behind the circumstance that moved in to block the view. Something about this truth made my heart leap with joy, for so plainly was it revealed in the sun still being there, still fixed in its ethereal home where it always is, not moving, even if the clouds and the rain came in to briefly obstruct it. But briefly obstruct is all that they do. But this morning, I did surely see it. Indeed I was reminded that there is so much life, so much offered, just beyond the clouds. That when darkness moves in, it does not negate nor erase the light that has a will stronger than anything else to be revealed, it simply moves in front of it for a while until it is has served its purpose and then will be gone once again revealing all that was still behind it, just waiting to peak out. I am grateful for this lesson revealed while on a walk around my neighborhood hillside, when the little rain showers came and brought unexpected surprises with them: that the sun is just beyond the clouds; it always has been, and it always will be. 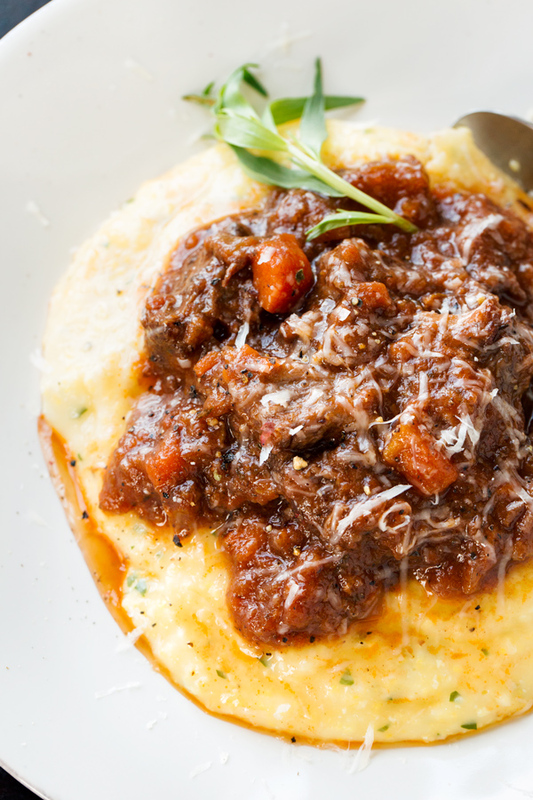 And now for some warming comfort, an offering ideal for those times when the sun is hidden: creamy and warming herb polenta with a tender braised oxtail in a rich, earthy tomato sauce. -Season the oxtails with a couple of good pinches of salt and pepper, and toss with the flour. -Place a large, heavy-bottom pan or Dutch oven (oven-safe) over high heat, and add in the oil and the butter; once melted, add in the oxtails, allowing them to brown on the first side for about 4 minutes, then turning over to brown on other side, followed by a little browning on the other sides; remove from pan. -Into the the same pan add the onion, carrot and celery, plus a pinch of salt and pepper, and saute those together for about 5 minutes, or until they begin to soften and take on a little color from the pan; add in the garlic, the Herbes de Provence and the tarragon, and stir to combine. -Once aromatic (about 30-45 seconds), add in the tomato paste and stir that in, followed by the red wine; allow the wine to reduce down for a few minutes until slightly thickened and a bit sticky. -Add in the beef stock and the crushed tomatoes, and stir to incorporate; add the browned oxtails back into the Dutch oven, bring to a simmer, cover, and place into the oven to braise for 2 ½ to 3 hours, depending on your oven. -During the last 45 minutes of the braising process, prepare the polenta according to instructions found below, and keep covered and warm. -Once the meat is tender, remove the oxtails from the pan and allow to slightly cool on a plate; skim off as much of the fat that is on top of the sauce as possible, then puree the sauce partially (using a hand-held immersion blender or regular blender). -Shred the meat (discarding the bone/cartilage and any really fatty pieces) and return back to the pan, tossing to coat in the sauce. -Check the seasoning, and add the fresh thyme leaves. 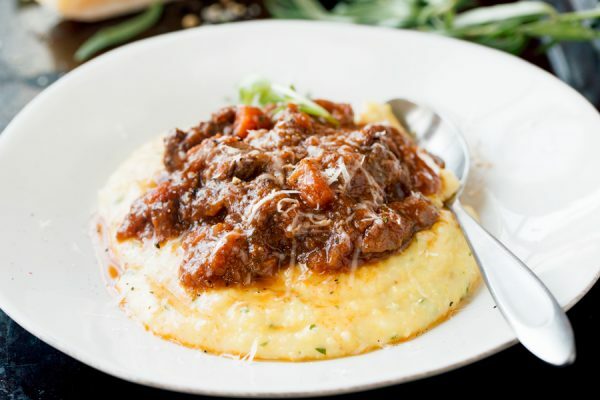 -To serve, add polenta to a plate or bowl, and spoon over some of the braised oxtail with sauce; garnish with a sprinkle of fresh parsley, and a touch of the freshly grated parmesan, and enjoy. 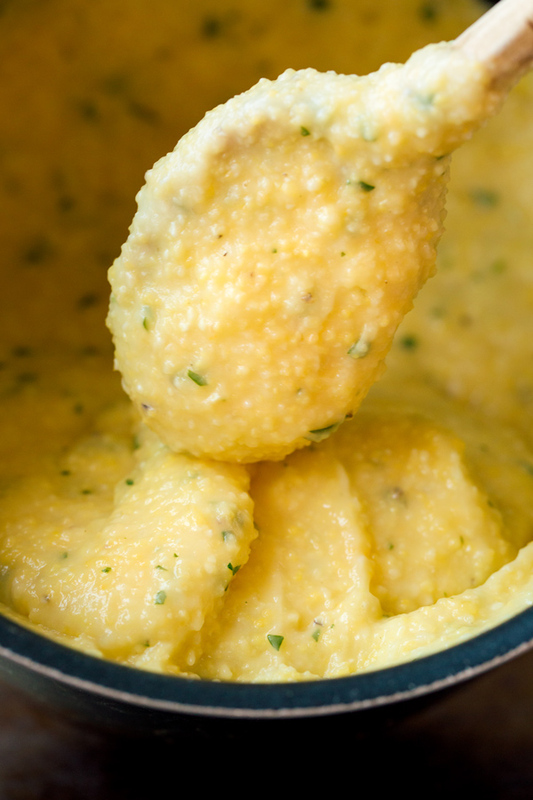 -Add the water to medium pot (non-stick, if possible), along with a good couple of pinches of salt (about 1 teaspoon) and bring to the boil; then, in an even stream, begin slowly pouring in your polenta, whisking all the while to maintain smoothness, allowing the polenta to begin to thicken up. 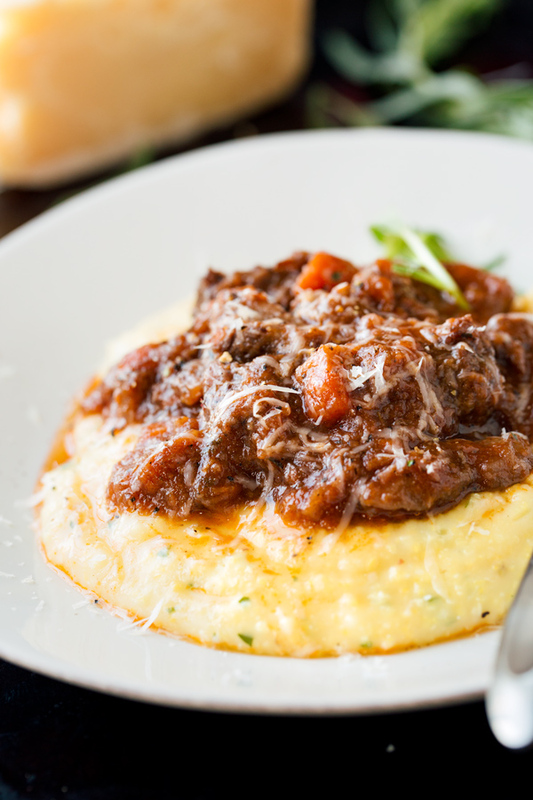 -Once it slightly thickens, reduce heat to low, cover, and allow polenta to cook for 45 minutes, stirring vigorously with a wooden spoon every 5-10 minutes so that it doesn’t stick to the bottom or sides of the pot. 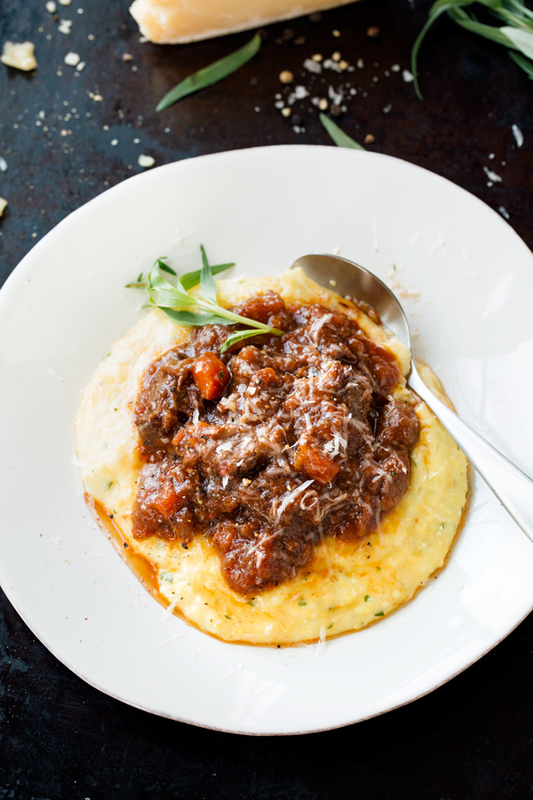 -After 45 minutes, when the polenta is tender and creamy, turn off the heat and whisk in the butter, the parmesan, the black pepper, and the herbs; check to see if another pinch of salt is necessary (take care not to make it too salty, as the sauce from the braise is savory); keep covered and warm—polenta will thicken up a little more as it sits. I made this last night and it was absolutely delicious! 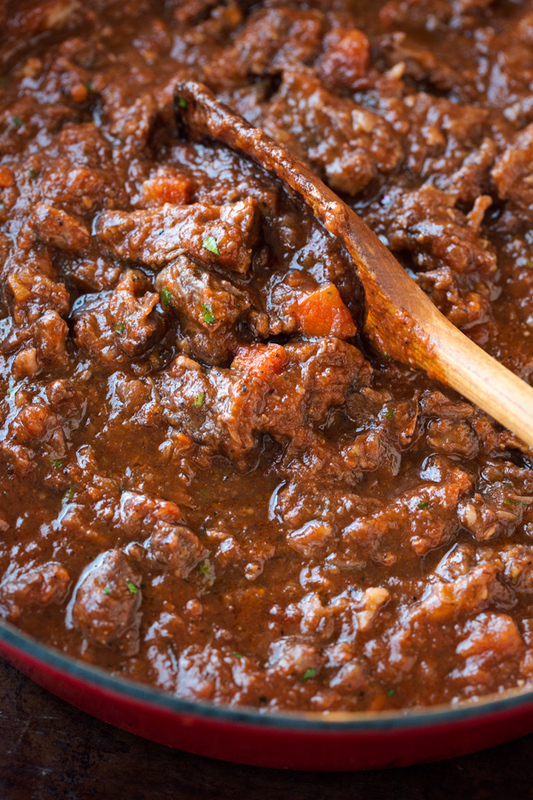 I used a pressure cooker to make the ragu and the flavors were beyond amazing. Your recipe was easy to follow and flavors were spot on. Thank you for sharing this beautiful recipe! This one is a keeper. Anita, I’m thrilled to read that! 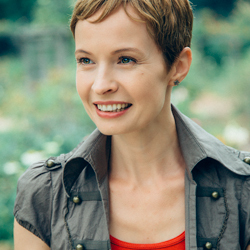 So glad you had a great experience with this recipe, and that you found it easy to follow. Thanks so much for your comments! That looks ridiculously DELICIOUS! I’ll definitely try this recipe when the weather turns colder here . . . though God know when that’ll be in Tucson! Thanks so much Cara! I hope you do get the opportunity to prepare this recipe—worth it even if it’s hot out, haha! 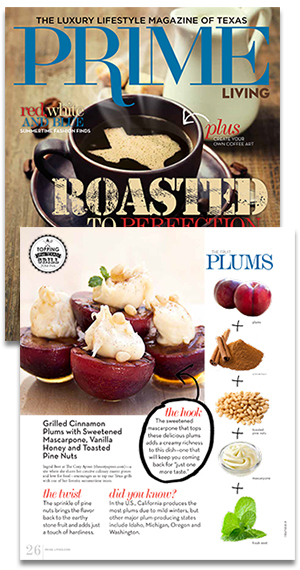 This recipe looks absolutely delicious-can’t wait to make it. But I do have one question-do to medical conditions, I’m getting chemo right now and can have no alcohol-can I substitute more beef stock for the red wine. I know alcohol cooks off, but at this point I can’t take any chances. Sending you my hopes for a full recovery and for healing, as well as for strength along the way!